The following locations near to Morro Bay are great birding areas that you can enjoy on your own during your visit. For locations, please consult the map. Registrants will receive a map showing these locations with their registration. 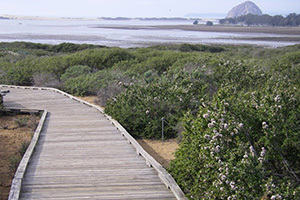 Friday, Saturday, Sunday 1:00 p.m.-4:00 p.m.
Plan to visit the 32-acre Nature Preserve owned and maintained by Morro Coast Audubon Society with its boardwalk and viewing platform. 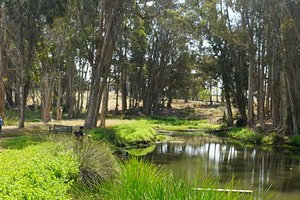 Observe freshwater ponds, wetlands, cypress and eucalyptus trees, and Back Bay viewing access. Expect to see passerines and wintering shore and water birds in a tranquil setting. Morro Coast Audubon Society's overlook is a small roofed platform on the edge of the Bay at the end of Third Street in Baywood Park. Plan to see plovers, egrets, ducks, sandpipers, willets, godwit, and hopefully the Virginia Rail and the Sora. 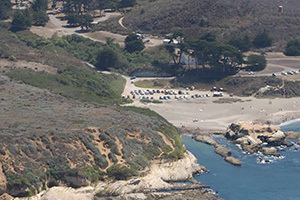 This 90-acre unit of California State Parks, located along Los Osos Valley Road near Los Osos, protects a coast line oak woodland with gnarled, multi-trunked trees 20-25 feet high, some as much as 800 years old. Other plant communities include coastal sage scrub and riparian woodlands. Birds include various woodpecker species, hummingbirds, Western Flycatchers, California Thrashers, quail, towhees and raptors. In 2005 Bird Festival observers spotted a Red-Naped Sapsucker. 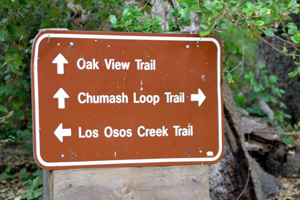 Both of these exquisite state parks offer numerous hiking trails and popular campgrounds. At Morro Bay, enjoy walks around the marina, mudflats, and Black Hill, including the Bouchon Trail (see next). At Montana de Oro, check out the interpretive exhibits at the Spooner Ranch House, the Holloway Demonstration Garden, and the tidepools. The Buchon Trail winds through a recently acquired conservancy on PG&E land between the southern boundary of Montana de Oro and the Diablo Canyon nuclear power plant. This walk is spectacular more for its path overlooking the rugged coast than for its birds, unblemished for the most part by human intrusion, until you reach the power plant overlook. Love it or hate it, the power plant is worth seeing. 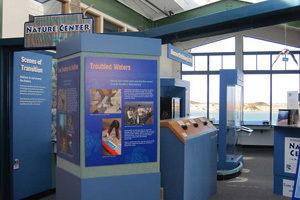 Located in Marina Square on the Embarcadero, the Morro Bay National Estuary Visitor Center offers an array of exhibits, including an 18-foot mural depicting habitats in and around the bay and other facets of our beautiful Estuary, as well as a spectacular view of the bay and Morro Rock. Admission is free and a variety of local literature is available. For more information, call (805) 772-3834. 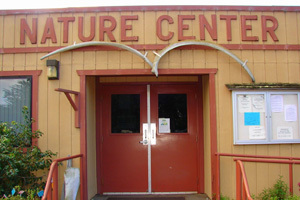 The Nature Center has local Chumash exhibits and displays of native plants, shellfish, varieties of seaweed, birds and nests. 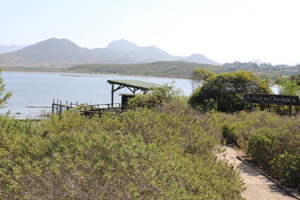 The trail around the Lagoon offers sightings of kingfishers, herons, egrets, ducks and many others. Take Pier Avenue off Highway 1. 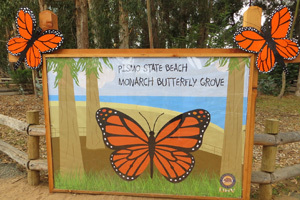 Friday, Saturday, Sunday, Monday 10:a.m. - 4:00 p.m.; talks at 11:00 a.m. & 2:00 p.m.
Join the Museum's Pismo Beach Docents at the well-known Monarch Butterfly wintering site. 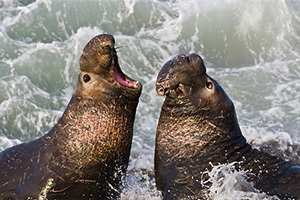 Friday, Saturday, Sunday 10:00 a.m. - 4:00 p.m.
Docents from the Friends of the Elephant Seals will be available to share their knowledge of this very active birthing and breeding season. 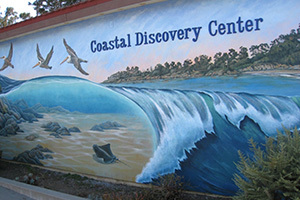 While enjoying the vistas of San Simeon Bay located at William R. Hearst Memorial Beach, enjoy the Coastal Discovery Center of the Monterey Bay National Marine Sanctuary. 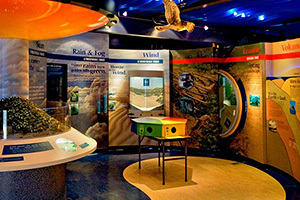 The main interpretive themes and exhibits at this center emphasize connections between land and sea. 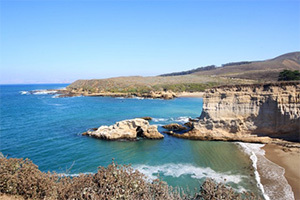 It is located about 30 miles north of Morro Bay and across from the entrance to Hearst Castle. For information, call (805) 927-6575.